Own the exclusive Click Licht. With what may we light the Shabbat lamp? asked the Rabbis of the Mishna some 2,000 years ago. And, despite their very detailed answer, none of them would have been able to even imagine the "Cliklicht®" as designed, hand crafted and signed by renowned Judaica artist Michael Kupietsky in Jerusalem. 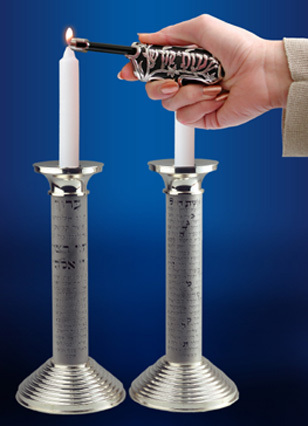 The "Cliklicht®" is unique Judaica, both useful and beautiful, sure to become an heirloom and very definitely a conversation piece. The "Cliklicht®" is a specially designed, refillable, butane lighter with a telescoping nozzle covered in a hand carved sterling silver sheath and delivered in an elegant black velvet presentation pouch. 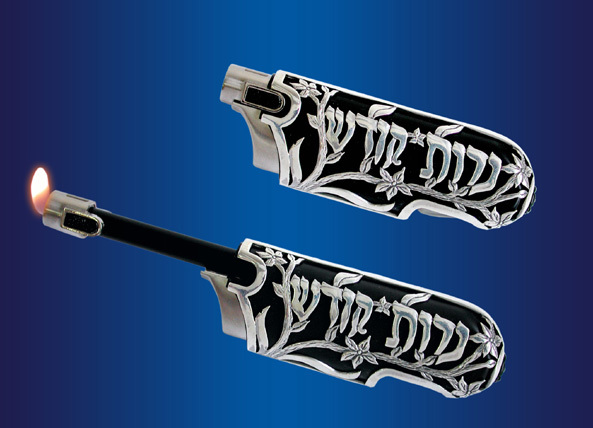 The words "Nairot Kodesh" (Holy Candles) are carved out on the silver, surrounded by carved vines and flowers, form fit to the lighter and fused on a jet-black background. This is Judaica that you will use. This is Judaica to give as a wedding or house gift. This Judaica is unique and fun and guaranteed to bring a smile, helping you usher in the Shabbat and Holiday in joy. The "Cliklicht®" will help spread the warmth of the Holy Candles as it helps you light them thus answering the question posed by our Rabbis so many years ago. The "Cliklicht®" is available in North America exclusively at Michael Strauss Silversmiths for $250. Click here to E-mail us. (mss@silversmiths.com) Click here to return to our product list.